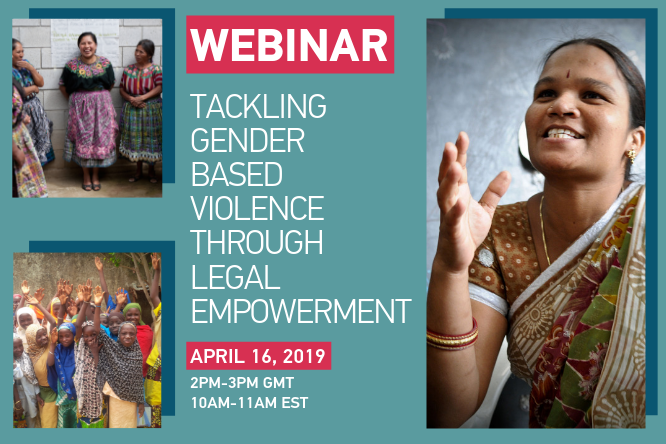 On April 16, you’re invited to a webinar led by three dynamo practitioners from Guatemala, India, and Nigeria on how legal empowerment efforts support women and girls to know their rights and take on leadership roles to end GBV. This webinar is led by three dynamo practitioners from Guatemala, India, and Nigeria on how legal empowerment efforts support women and girls to know their rights and take on leadership roles to end GBV. You’ll hear from Network member Kate Flatley of Women’s Justice Initiative (WJI). Guatemala has the third highest rate of femicide in the world. Rural, indigenous women are especially vulnerable due in part to their social isolation and limited access to resources. WJI is building a pipeline of paralegals and bilingual Mayan Kaqchikel-Spanish resources that reach these marginalized groups to ensure all women and girls, including those who may not be able to leave their homes or communities, can access the legal support and counseling they need.